AMMONNEWS - With its rock-hewn ancient city of Petra, lunar-like landscape of Wadi Rum and a medical tourism drive, Jordan is luring back foreign visitors scared off by regional upheaval and extremist attacks. Abundant natural wonders and ancient treasures have long attracted tourists to the kingdom, traditionally seen as a haven of peace in a war-ravaged region. But after the Arab Spring uprisings convulsed the Middle East in 2011 and Daesh later rampaged across neighbouring Syria and Iraq, visitor numbers slumped. Jordan welcomed seven million tourists in 2010, but arrivals plunged to around 3 million in each of the following two years, according to tourism board head Abed Al Razzaq Arabiyat. Efforts to reverse the slide suffered a major setback in 2016 with a string of attacks in the kingdom, a member of the US-led alliance against Daesh. A Canadian tourist was among 10 people killed in a shooting rampage claimed by extremists in Karak, home to one of the region’s biggest Crusader castles. But the spillover from the Syrian conflict has since abated and in 2017 tourist arrivals rebounded to more than four million, officials say. “Jordan has proved to be a safe haven in a region which is witnessing turmoil,” Tourism Minister Lina Mazhar Annab told AFP in an interview. The country’s goal is to bring annual tourist arrivals back up to 7 million by 2020, she said, guiding a group of visitors through the steep paths of the ancient Nabataean city of Petra with its rose-pink cliffs. The Unesco World Heritage Site, which featured in the Hollywood film ‘Indiana Jones and the Last Crusade’, was once a major crossroads for caravans transporting Arabian incense, Indian spices and Chinese silks. Today, Jordan’s historical jewels are a major draw. “I came here because it’s a country with huge cultural wealth,” said French tourist Emmanuel Reneaume, visiting the Amman Citadel perched at the top of a hill in the capital. “Just behind us there are ruins, a Roman temple, a Byzantine church and an Umayyad mosque. It’s exciting,” he said. 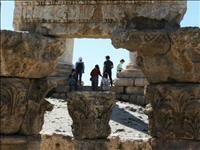 Jordan boasts 21,000 archaeological and historical sites that span millennia, according to the tourism board. They include the Roman ruins of Jerash, the Dead Sea and Wadi Al Kharrar, or Bethany Beyond the Jordan, where some biblical historians believe Jesus was baptised. Such sites are helping to attract a growing number of tourists from Asian countries including Malaysia, Indonesia, China and India, according to the authorities. “People are coming back from all over the world,” said the tourism minister. Lacking in natural resources, the country of nearly 10 million depends on tourism for around 12 per cent of gross domestic product (GDP). In an attempt to diversify, the kingdom has sought to become a regional hub of medical tourism. “Between 250,000 and 300,000 foreign patients are admitted in Jordan each year, bringing in up to $1.5 billion,” said the president of the country’s Private Hospitals Association, Fawzi Al Hammouri. In March the government adopted a measure facilitating the entry of patients from Iraq, Yemen, Syria, Libya, Sudan, Chad and Ethiopia, allowing them to obtain a visa within 48 hours. Samer Mustafa, a 50-year-old Iraqi who underwent open-heart surgery in a private hospital in the capital, said he was attracted by Jordan’s “stable security situation, the cleanliness of its hospitals and the absence of power cuts in such facilities”. Medical tourism now directly employs 35,000 people in Jordan, according to Hammouri. The majority of patients come from Saudi Arabia, Iraq, Libya, Sudan, Yemen, Syria and the Occupied Territories. Jordan is also a stop for Muslim pilgrims visiting holy sites in the region. And now the kingdom hopes to woo more European visitors thanks to an agreement struck in February with low-cost airline Ryanair for 14 new routes between Europe and Jordan. All of which gives tourism agency owner Salama Khatar reason for optimism. “Business is good. Since August we are starting to return to the situation of 2010,” Khatar said.